It has been years and years since the Denver Nuggets had won in Utah, but if they wanted to secure the second seed in the Western Conference on Tuesday night, the first step would be exorcizing those demons. 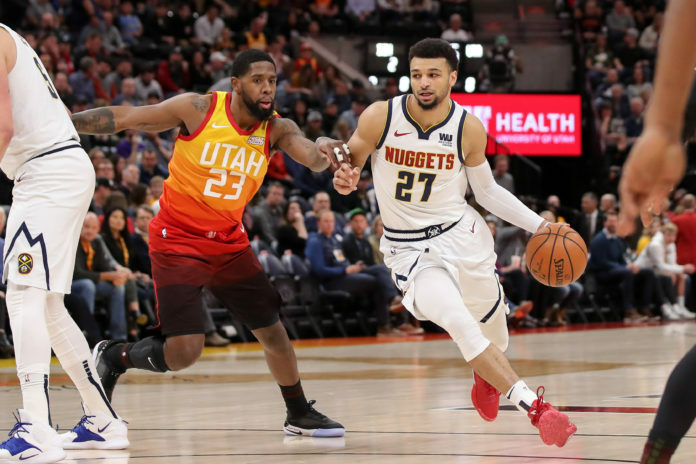 In the past eight meetings in Utah, Denver has failed to secure a single win, but they went into Vivint Smart Home Arena with the intention of coming away victorious regardless of their track record. After resting Nikola Jokic, Jamal Murray, and Paul Millsap against the Portland Trail Blazers, the Nuggets had a fully healthy and active roster — other than Michael Porter Jr., who has been out all season — in their dance with the Jazz as the Nuggets chased the second seed in the brutal Western Conference. In a game that Denver desperately wanted to win, Nikola Jokic put together his worst performance of his career as the Nuggets fall 118-108 in Utah to the Jazz. With Denver’s loss, their odds of holding onto the second seed in the Western Conference has fallen off drastically which means they will likely not have homecourt advantage in the second round of the playoffs, if they get that far. In the first quarter, the Nuggets 3-point shots were not falling which crippled their offense. Denver starting to see their deficit balloon larger and larger and their shots continued to bounce out which led to them taking more and more jump shots instead of getting downhill and attacking the rim. As Denver stopped attacking the rim, their offense continued to struggle. Just to make matters worse, Denver had no answer for Donovan Mitchell. 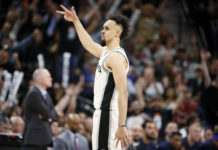 The second-year lead guard managed to score 17 first-quarter points which was just four points less than Denver scored as a team in the entire 12-minute period. By the time the first quarter buzzer sounded, the Nuggets trailed 27-21 in Salt Lake City despite shooting 1-6 from 3-point range. 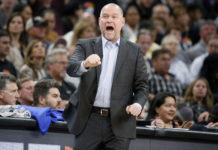 Denver then started 0-4 from the field in the second quarter and suddenly found themselves down 12 points which led to an early timeout by Malone as he tried to get his team back on track. Thankfully, Malik Beasley answered the call and splashed home two 3-pointers in three possessions out of the timeout to drag Denver back into the game. Those two 3-pointers completely changed the momentum of the game. The Nuggets got punched first, but Beasley’s counter attack rejuvenated the rest of the Nuggets roster, who stormed back thanks to a 23-7 run. That big run by Denver, as well as nine points in under two minutes from Jamal Murray to finish the first half, is why Denver was able to dwindle their 12-point deficit down to just one single point as the halftime buzzer sounded. Despite Denver being on the road and Mitchell scoring 27 points in the first half, the Nuggets only trailed 60-59 at halftime. Considering everything that happened in the first two quarters, trailing by one point was a welcomed outcome. The Nuggets came out swinging to start the third quarter. They took a lead very early into the period as Denver’s starting backcourt of Murray and Harris continued to produce at a high level. One of the Nuggets biggest issues of the season was their inability to get their guards playing strong basketball at the same time, but against the Jazz, Murray and Harris both had strong performances. Still, Denver’s bigs were not getting the job done and that fact doomed Denver in the third quarter as the Nuggets attempted to erase Utah’s lead. Jokic and Millsap were both merely aberrations as they failed to score, rebound, or create for others consistently through three quarters. Once the third quarter came to an end, Millsap and Jokic had combined for a meager six points, five rebounds, and three assists on an awful 2-11 shooting from the field. In the first half, Denver’s reserves relentlessly attacked the Jazz, but in the third quarter, a 13-5 run by Utah’s bench unit pushed the Jazz lead all the way up to 10 points. Still, Beasley was not done shooting Denver back into the game. He hit another 3-pointer with just over 30 seconds remaining, but then the unthinkable happened — Mason Plumlee drew a shooting foul on a 3-point attempt with just 1.3 seconds remaining in the third quarter which led to the Jazz also picking up a technical foul for arguing the call. Beasley made the technical free throw, but Plumlee only hit one of his three foul shots. Still, those extra five points created by Beasley and Plumlee to end the third quarter helped Denver climb back within single digits as they entered the fourth quarter down 91-85. In the fourth quarter, the Nuggets badly needed their MVP candidate to step up. Jokic had barely contributed at all through three quarters and the fourth quarter was no different. 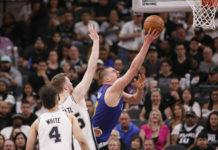 Jokic entered the fourth quarter with four fouls and quickly picked up two more in the first three minutes of the final quarter of the game which led to his removal. Jokic only played 16 minutes and finished with just two points on 1-6 shooting to go with five rebounds and two assists for arguably his worst game as a professional before fouling out. Still, the Nuggets refused to quit. For the remainder of the game, they battled, but Denver was unable to reclaim the lead as they fell to the Jazz 118-108 for their ninth-straight loss in Salt Lake City. Murray led the Nuggets with 22 points on 9-21 shooting from the field to go with three-made 3-pointers. Morris and Beasley also were great. Morris finished with 22 points and four assists while Beasley added in 22 points including four-made 3-pointers. For the Jazz, Mitchell was a monster as he finished with a career-high tying 46 points on 14-26 shooting to go with 13-16 from the free-throw line.